NOTES: Injected plastic stand model with no interior. 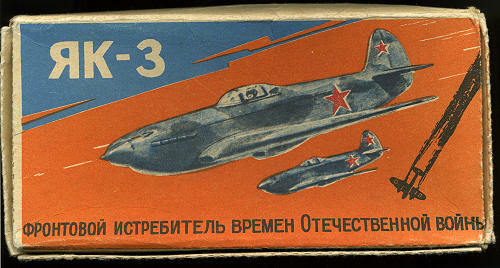 Packed in a typical Soviet era box that is made from recycled cardboard, inside is a newsprint quality set of instructions, a decal sheet with eight stars and the kit inside a greasy, polyethylene bag. Parts count is minimal as this is a stand model. No cockpit and no landing gear. In fact, gear doors are not even outlined on the underside of the kit. All of the detail is raised panel lines, including the control surface hinges and the decal placement marks for the stars. I have not seen this on a kit since I was a pre-teen back in the early 1960s. 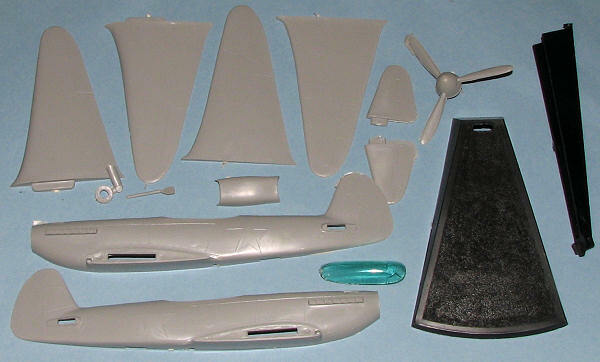 Most modelers will be sanding away these markings and rescribing at least the control surfaces. The rest of the detail is fairly good when it is there at all. As you'd expect, there is flash, and the prop spinner in particular has a nasty sink area. These are also found along the fuselage opposite alignment pins. These pins are best sanded off as they are basically tiny nubs and are misaligned so that the halves will not mate up properly. I'm not sure why, but it seems like the Soviets were fond of light blue for their clear parts and this one has a single, well molded, and thick canopy. A very beefy stand is included on which to display your model when done. Instructions are adequate and note where the various parts are to be located. I'm assuming there is painting information on there somewhere, but as my ability to read Russian disappeared shortly after my stunning good looks, I don't know for sure. The insignia decals are useless, probably because they are old. I cut one out and when it grudgingly decided to depart from the backing sheet, it did so in near microscopic pieces. Aftermarket will be your only recourse. This is one of those where you can't just run down to the local store and grab one. I picked this one up as it was cheap and I thought it would be an interesting build. It will also give me an opportunity to try out my UMM Scriber as I'm not much of a rescriber and this would be a perfect kit on which to practice. If you would like your product reviewed fairly and quickly , please contact me or see other details in the Note to Contributors.